Excellent artist. Shows up on time and is very professional. I'm an event planner and have used Michaelangelo twice now. Looking forward to working with him again! "I'm so happy I found Michael Angelo. I hired him for my proposal event at El Matador beach. This is guy was very professional and flexible. I had to change the date of the event and he was very accommodating and was very flexible with me. His work was amazing as well. He drew my fiance and I a caricature of us on the day of the proposal. I was very happy with his work. I could not do the proposal without him. I'll definitely hire him again for future events. Thanks man :)"
"I'm glad to have Michaelangelo at our wedding. He did a great job working on our guests. All the guest thought I was a nice touch. Thank you so much for making my dream wedding amazing!" Michael did an excellent job at our event. He's very professional and everyone loves is caricatures, especially the kids. His pricing was affordable! What a hit! Michelangelo and Clara were the perfect pair for our 60th birthday party! They were on time, even stayed a little longer and were very positive and pleasant. Every guest was able to take home a favor of a caricature of themselves and everyone enjoyed there Palm reading. Thank you again! Where do begin? I had the pleasure of meeting Michael Angelo and his wife at the Bugatta Restaurant in Beverly Hills. I am writing this review to inform the world on how wonderful my surprise engagement caricature is :) While having dinner with my now fiancé, I seen that Michael was painting an image of his wife and thought to myself that he was very artistic. My fiancé notice that I was gazing at Michael's artwork and asked me if I would like a picture of us. I responded with an enthusiastic "YES" of course. Not knowing my fiancé set this entire surprise up, shortly after; Michael approached our table and started drawing his heart out while we were enjoying a glass of wine. While conversing with Michael and my fiancé, I must say, he went over and beyond with making us feel comfortable while perfecting essence of love through his art. 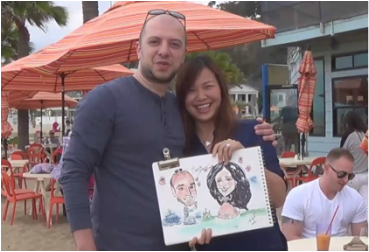 Although, this was Michael first time drawing an engagement caricature, he was very accurate with his artistic skills and seemed genuinely interested in helping us create a moment of a lifetime. Furthermore, after the caricature was complete my fiancé showed me the caricature of him on one knee proposing, and as I look up he is doing just that; asking me to MARRY HIM. I was so shocked, surprised, and filled with joy. Lastly, I was concerned Michaels wife felt left out sitting at the table by herself, however; our fabulous moment was captured on a hidden camera filmed by Michael's wife the whole time :) All credit to my finances and Michael efforts, we were able to enjoy every moment of that night. We will definitely book Michael at all of our wedding and for other events, as well as recommending him to others. He and his wife are a great team and my fiancé and I felt very respected and valued.